Quick question, when I open my hood (repop nasa from mustangs unlimited), I have to kind of walk the hood forward a little at a time as I am lifting to open it, Same with closing it, have to kind of "walk it" backwards. I have had a 72 Mach 1 years ago but just cannot remember if the hood acted the same way when opening or closing it. Could this be the sign of worn out hinges? I also noticed that the hinge springs are the rounded version, not the ones with the flat sides to the springs that I have read are correct for the nasa hood, could the wrong springs be the reason for this? Thanks, hood goes up and down easy and stays open with no issues, just wanted to know if this is normal or not. Thanks for any assistance. (03-30-2019, 07:47 PM)vintageman Wrote: Quick question, when I open my hood (repop nasa from mustangs unlimited), I have to kind of walk the hood forward a little at a time as I am lifting to open it, Same with closing it, have to kind of "walk it" backwards. 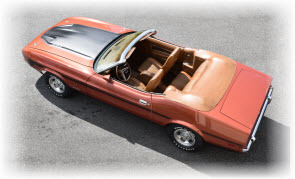 I have had a 72 Mach 1 years ago but just cannot remember if the hood acted the same way when opening or closing it. Could this be the sign of worn out hinges? I also noticed that the hinge springs are the rounded version, not the ones with the flat sides to the springs that I have read are correct for the nasa hood, could the wrong springs be the reason for this? Thanks, hood goes up and down easy and stays open with no issues, just wanted to know if this is normal or not. Thanks for any assistance. My understanding is that the hinges work on a kind of cantilevered principle so good idea to help by pulling toward you and up to open, push slightly back & down to close. There's a fair bit of weight to avoid twisting as well so I use both hands placed either side of the latch to spread the load. Hinges: again, info on here suggests the flat surfaced springs were used for hoods with the ram - air plenum fitted to counteract the extra weight - possibly greater tension strength. Others have two round style & ram air with no problems. I have one of each - dah ? In summary, my .02 is that you're fine - just go easy on it. Thanks for the quick replies, I appreciate it. I will take it easy on opening and closing it, part of my old memories say that my last 72 hood opened the same way. BTW, that other thread was from Turtle, when he had his winter project and the repop hood buckled, I do a lot of referring back to his thread for the pics and knowledge that he put into that and other jobs. On the hinges. I am in the process of redoing the phosphate on mine. If someone has painted the hinges instead of phosphate that makes the surfaces sticky and harder to open and close. The phosphate is a wear / lube coating used on several parts. All NASA hoods got the flat springs nothing to do with the ram air. My 72 & 73 both have them and my 72 Q code vert does and it did not have hood locks even but all Q codes got NASA hood in 72.. The flat springs are stronger and I always rock my hood back and forth as I close to prevent bending even a stock hood. Spray a little lube on the pivot points in the hinge. It might not stay open then, lol. My original ram air hood is heavy with the locks and plenum attached. My original flat wound hood springs and hinges would no longer support the weight of the hood. It went up easy but would come down on it's own with the car idling. Years of wear and because I had lubricated them to make the up and down go easier turn out to be the problem. I bought a pair of original regular hood hinges (not repro), I carefully hammered the hinge pins at the pivot points to tighten them up and transferred the flat wound springs to them. That solved my problem. Now I have to rock my hood to lift it and the same initially to get it started on the way down, but it stays up. As an extra precaution it went to a slightly larger bolt and j-clip where the hinge attaches to the hood. The bolts that attach the shock tower brace to the cowl are perfect for this up sizing. You just need to find the right j-clip for them. I had a trouble with opening and closing my hood when I first got it. I had repo hinges and I just put a very small amount of lubricant on each of the hinges, but only on one of the pivot points. After I opened and closed it a few times it was way easier to deal with. Made a huge difference in the opening and closing of it. I really couldn’t believe how much better it was and it stayed open with no problem. Just make sure to apply a very small amount, you can always add more. It worked for me, and I only have one arm that works, so I needed some help with this. It really sucked before trying this. So like David mentioned the, factory ones were phosphate coated which gave them some lubrication. The aftermarket ones are only painted and they are harder to operate. I could see the paint rubbing off on them. Plus they aren’t as good as the original ones either, of course. Another quick question though since it is related to the hood. When you all close the hood completely, can you lift up and it open slightly? I can close mine, then pull back up on it and it will lift a couple of inches, does not come any further than that but it does concern me some. 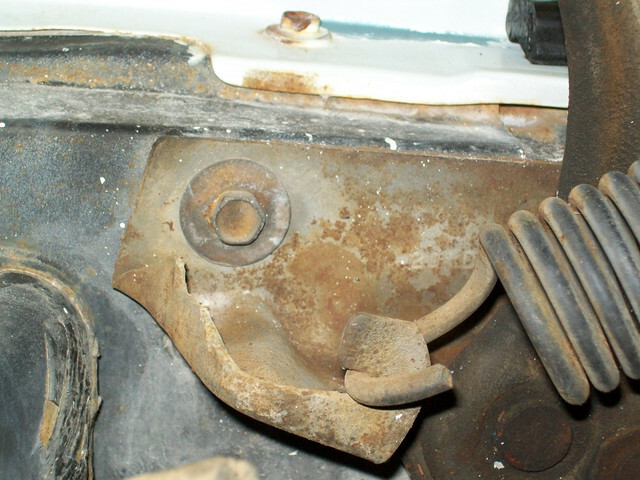 I do plan on putting hood pins back on the car and it will be a while before I install the engine but things like this keep me up at night, do you think it is normal or do I need to adjust my hood latch or is it something else maybe? I have good gaps between my hood and fenders so I don't think there is a hood alignment problem. Thoughts? It sounds like the primary latch is not latching, and you are lifting it up against the secondary (safety) latch. It may need cleaning and lubrication also, adjusting, or repair/replacement if the spring is missing or broken or pivot points are worn out.